Now that you’ve chosen Alexa as the center of your smart home setup, the first step in making your smart home dream a reality is to connect your Alexa device to your home network. Amazon has made connecting your device to the network very easy if you have a smartphone or tablet with the Alexa app. Since the Echo Dot is such a common device we’ll use it here to illustrate the basic steps to connect Alexa to your home network. Now that Alexa is connected to your home network, you have the beginnings of a smart home. Let’s see what we can connect with Alexa to get the benefits from your new technology. One of the easiest things to set up in your new smart home is Alexa-controlled lighting. Amazon sells a wide variety of smart light bulbs, lamps, and even electrical outlets that allow you to control the lighting in your home through the Alexa app and your Alexa device. One of the benefits of setting up a smart home with Alexa is having full control of your home environment down to the very temperature the house. Programming and controlling your smart thermostat like the [Product Name] gives you the power to ensure that your home is always at the right temperature for your family’s activity level and time of day. Save money and be more energy efficient by turning the temperature up during warmer months when you’re away from home at work and school. Then, have Alexa cool down your house before you arrive. Work with your body’s natural rhythm, and wake up more naturally by having Alexa increase the temperature in the minutes before your morning alarm. Your Alexa-connected smart home would not be complete without integrating entertainment. Alexa can connect to your smart TV, and if you don’t have a smart TV, Alexa integrates very well with the Amazon Fire Stick which can be used with any TV with an HDMI input. Many new smart TV’s support Alexa almost right out of the box. Essentially, once you connect your smart TV to your home network, you can connect it to Alexa through the smartphone app using the manufacturer provided Alexa skill. One thing to note, smart TV’s like the LG referenced below allow you to control channel and volume selection as well as turning off the TV, but will not actually turn the TV on. With your smart TV connected to Alexa, you can use voice commands to find programs for you and your family to enjoy. If you have multiple Alexa devices, you can even use them to communicate between rooms of your house like an intercom system. By using the “drop-in” feature to turn on two-way communication between Alexa devices, your family can stay connected without having to use your “outside voices”. The “drop-in” feature is available with any of your contacts who have the permission enabled for you on their own Alexa device, so the kids can drop in on Grandma whenever they like. At home, it can also help you calm your little ones who may need to hear your voice in their rooms on stormy nights. One of the most innovative and forward-looking features of the new smart home is automated access control. Smart locks add futuristic capabilities to your home with the ability to unlock your door as you approach and lock automatically when you leave. Never wonder again, “did I lock the doors when I left home?” because smart locks allow you to know using your smartphone that your door is closed and locked. Alexa-connected smart locks often add the additional benefit of locking and unlocking doors by voice command and passcode. Smart locks like the above offer amazing features like automatic unlock with proximity of your smartphone as well as granting access to others remotely, even on a temporary basis, making them ideal for people with out-of-town guests, or temporary tenants like AirBnB. Smart locks are only one aspect of a comprehensive home security system that can be implemented in a smart home with Alexa. In addition to controlling who enters your smart home, you can also monitor your home inside and out with Alexa-compatible security cameras. There is a wide variety of security camera options. Make sure you determine which features are important to you before ordering. We’ll be working on writing a buyer’s guide to help you make those decisions. Bookmark this page for later to see just which cameras we recommend. Smart security cameras can be used to monitor the perimeter of your home, keep track of little ones, or even help protect your deliveries from Amazon! With all of the available smart devices, you can connect and automate many household functions. For many of your household devices that don’t have specialized smart devices, you may consider using smart plugs. Smart plugs allow you to control power to your not-so-smart appliances allowing you to power them off and on based on the schedule you choose or even by voice command. The Kasa Smart Wi-Fi Plug by TP-Link is one of few smart plugs that work directly with Alexa without the need of a brand-specific hub. 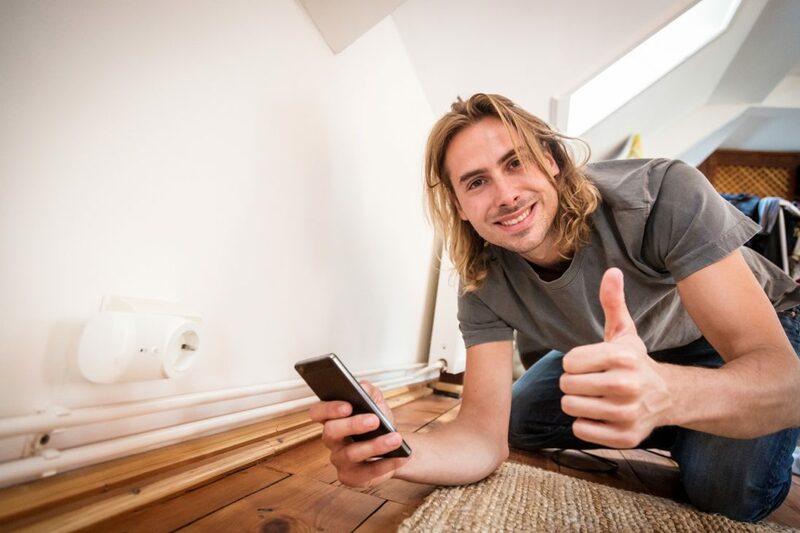 The benefits of smart plugs are numerous. Increase security by turning lights off and on while you’re away from home. Have the peace of mind that you didn’t leave the iron on by always plugging it into a smart plug that you can check remotely via your smartphone. Save energy and possibly even lower your electricity bill by scheduling appliances to power down when not in use. Setting up a smart home is a process that can take time: time to make decisions as to which home automation features you want to implement and how you want to do it. If you’re like us here at Home Plus Tech, the process of setting up a smart home is a fun one. And though installing all of these smart home devices can get pricey, you can prioritize which features are most important to you and your family and implement those first. The best place to start, we think, is with your Alexa device. Click here go to Amazon and see an extensive list of smart home technology that works with Alexa!